One thousand years after a global catastrophe, small pockets of humanity live on the fringes of a massive toxic jungle. 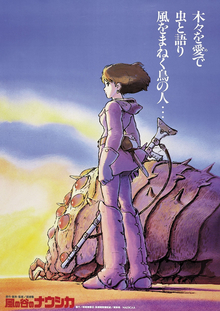 Nausicaä (Sumi Shimamoto) is a princess of the Valley of the Wind. Her lands are invaded by the warlike Tolmekians, who aim to revive an ancient giant warrior to ensure victory over neighbouring kingdoms. After escaping from their clutches, Nausicaä makes a journey that reveals the truth being the toxic jungle – and points to a potential future for the people of the world. Based on his own 1982 manga, Hayao Miyazaki’s Nausicaä of the Valley of the Wind is a beautifully imaginative and realised animated feature. It is a film of historical significance. While not Miyazaki’s first animated feature (that would be 1979’s Castle of Cagliostro) it is his first wholly original work and his first working with noted composer Joe Hisaishi. Using the profits from this film, Miyazaki partnered with fellow director Isao Takahata and producer Toshio Suzuki to found his own animation company Studio Ghibli. The rest, as we are prone to say, is history. While Nausicaä is a less sophisticated film that its Ghibli cousins, it does show off most of the themes and creative approaches that Miyazaki would apply to his subsequent films. Scenes of flight are peppered throughout, and a strong ecological element drives the narrative. He develops a strong and appealing female protagonist in Nausicaä, and situates her within a rich and charming fictional world. The world-building is one of the film’s strongest assets. Nothing is ever expressly laid out for the viewer, but rather filters through in a deliberately piecemeal fashion through context. There is as much backstory as is needed to tell the story, and that is all. Visually the film owes an enormous debt to the French comic artist Jean “Mœbius” Giraud, with much of the design echoing his famous Arzach works among others. It is an aesthetic that works brilliantly. Particularly eye-catching among the film’s many creations are the Ohm, enormous chitinous creatures with 12 eyes apiece – eyes that glow blue when content and red once enraged. They appear throughout the film, and are its most memorable and original elements. While the film may be Miyazaki’s first collaboration with Joe Hisaishi, it is a partnership that pays immediate dividends. Hisaishi’s score, which blends electronica and acoustic instruments, gives Nausicaä’s world a rich identity and tone to complement the visuals. The two men go hand-in-hand through their career. It is difficult to imagine Miyazaki’s worlds being as effective and enchanting without Hisaishi’s emotive and imaginative scores to underpin the action. It is true that the film has dated – what 34 year old film wouldn’t? – but there remains a richness and an enormous charm to Nausicaä that cannot dissipate with age. By the time of directing the film Miyazaki was already a 13-year veteran director of anime. It is, however, his breakthrough picture. It is the work which satisfies the enormous potential that underpinned so many of his earlier television works. It heralded the beginning of one of the most exemplary feature directing careers in history. This is one of the all-time greats of animated film.